What are the different career options in the Building and Construction Trades? Look around. Almost everything you see has been built. Over the years, highways, skyscrapers, bridges…entire cities, have been built by tradespeople. To learn more about the many different construction career options that can provide your students with a secure, bright future, click here. Which students should consider the trades? If you have a student who possesses these qualities, then a career in construction may be a great fit! What does an apprenticeship in the trades offer? Apprenticeship is an education program that allows students to apply what they learn in books and classes directly on the job under the supervision of expert craftsmen, called journeymen. Apprenticeship is hard work, both physically and mentally, but it’s work your students will be proud of for the rest of their lives. And, there are ample advancement opportunities for every person, man or woman, who takes this career seriously. After all, apprenticeship in the building trades is preparing young people for more than just a job; it’s preparing them for a lifelong CAREER with a skill set that’s portable. A construction professional can go virtually anywhere with this education. And, construction professionals have a number of career options, so your students can choose the path that’s right for them. To find out more about what apprenticeship in the trades has to offer, click here. What are the general requirements of apprenticeship programs in the trades? Why should I promote apprenticeship to students who have the grades for college? There are more and better opportunities in the construction profession than any time in its history. New technologies are being developed every day, and the need for talented, enthusiastic young people is essential. Educators overlook promoting construction careers for a variety of reasons: they think the work is too physically demanding, or that it’s not academically challenging, or that it’s difficult for students to get “in.” The truth is, trained construction professionals are in high demand so the trades are always looking for qualified applicants. While the work is physically demanding, many men and women meet those demands every day. In fact, it’s a great way to stay in shape. Plus, the building and construction trades are professions requiring a great deal of academic knowledge like algebra, geometry, physics, trigonometry, chemistry, and, of course, reading. After all, could you imagine a plumber who didn’t understand the geometry of circular pipes or an electrician who couldn’t read blue prints? If you ask anyone with a career in the construction industry, they’ll tell you they love what they do. There are many reasons for such high job satisfaction. First and foremost, construction professionals make great money and receive generous benefits. And, they begin making money right away, even during their apprenticeship. Factor in generous health benefits and life planning for themselves and their families, and it’s easy to see that the construction professional is the right financial fit for today’s young people. In fact, trained construction professionals earn a salary higher than many white-collar professions. Total compensation packages approaching or even exceeding $100,000 are not uncommon. And, with portable skills, construction professionals can advance their careers around the country or around the globe. What are the pay and benefits for apprentices in NJ? 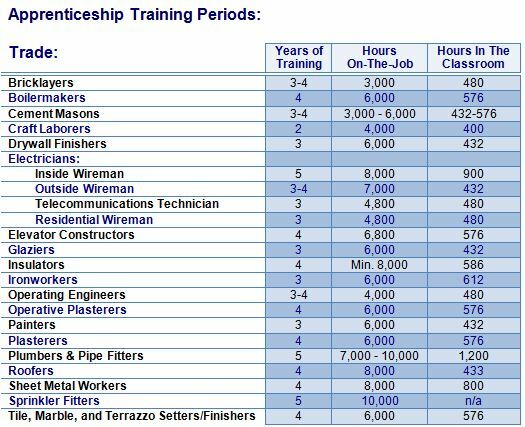 Apprenticeship salaries are based on a percentage of the journeyman hourly pay scale. Most trades start at 45-50% of the journeyman rate and increase at regular intervals. In addition to earning a wage and receiving a free education, apprentices also receive paid benefits such as family health insurance, pension, annuity, and vacation. Click here to see a sampling of journeyman pay rates. Where can I find more resources to promote apprenticeship in the trades?